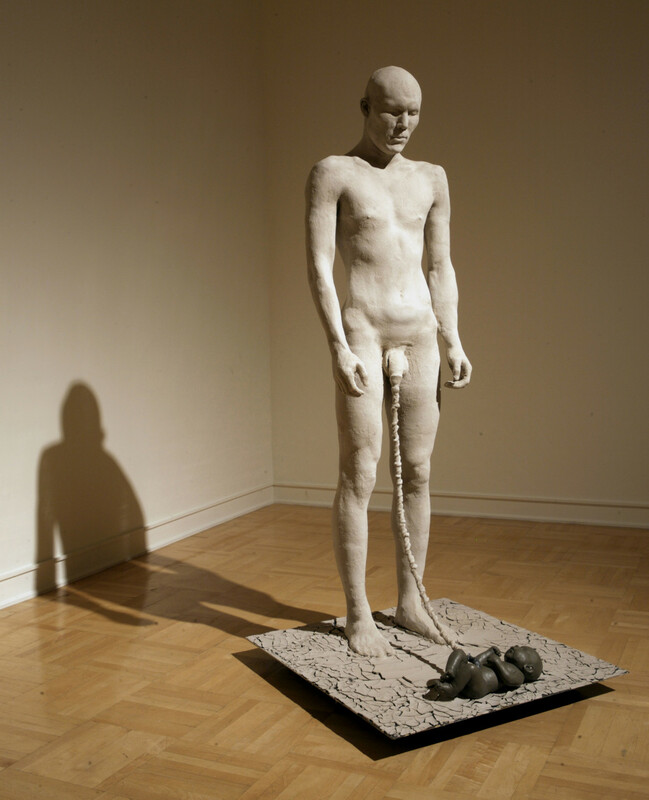 Visually, the sculpture portrays an adult male figure connected to an infant by an umbilical cord which stems off of the male’s genitalia into the infant’s belly button. 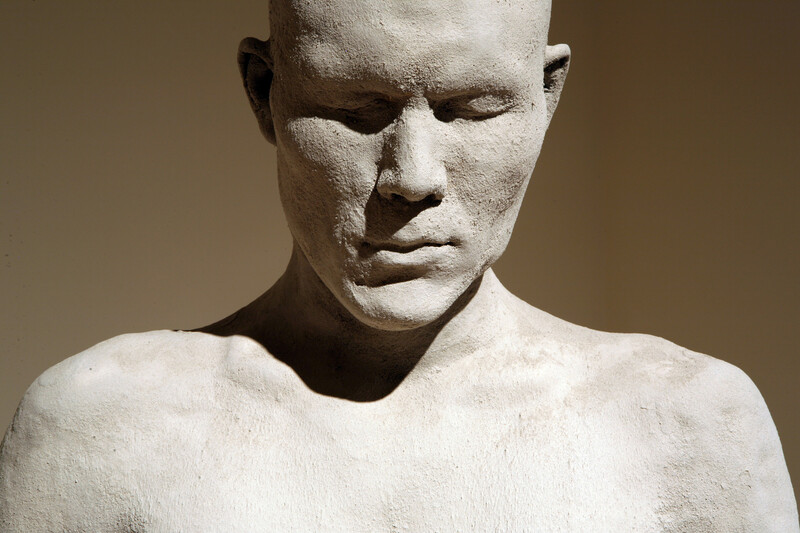 The adult male figure looks to be made of clay powder and could disintegrate with a single touch. The infant looks like it is made of wet unfired clay. Immediately there is the contrast between the brittle, disintegrating look of the male and the freshness of the baby. 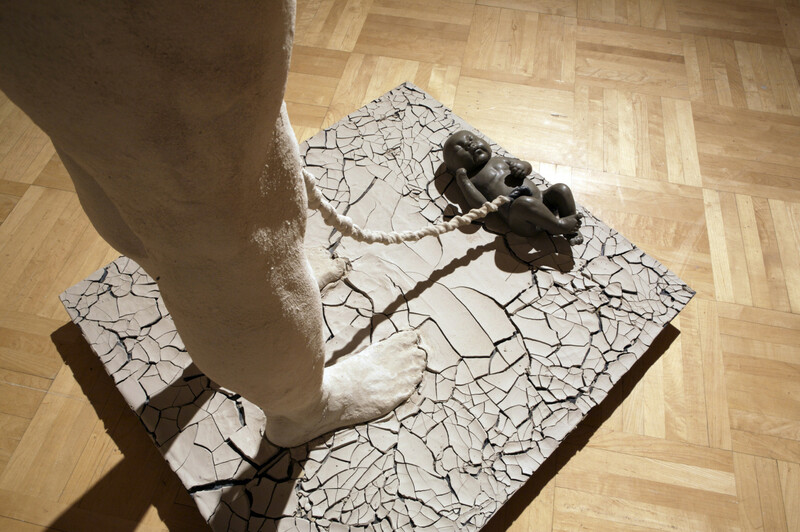 By using a visual connection universally associated with a bond between a mother and her child, the sculpture begins to look at the paternal bond between the father and son. The male’s facial expression and body gesture looks tense, as if he is on the precipice of making an important life altering decision. At this particular frozen moment in time the male appears to have withdrawn into his own consciousness. In contrast to the adult male, the infant looks small and vulnerable, as it faces the male figure. The dry, disintegrating quality of the adult male suggests, along with a whirlwind of other potential emotions, that the adult male has become more aware of his own fragile mortality in the presence of his newborn son. I can say from my own feelings when looking at babies, that I get the sense that new life is essentially the replacement for the old, that a new baby is the eventual replacement of his father’s place in the world. Personally, it is hard for me to accept my own mortality. Maybe the acceptance of one’s own mortality gets easier with age, but with Seed, the adult male figure is just beginning to realize the gravity of the situation he is in. However, hope comes through in various ways. The freshness and softness of the infant gives a clear sense of hope through the renewal of life. What is also reassuring is the fact that on one hand, the male might have become more aware of the inevitability of his own mortality but also he might realize that by having a child he is spreading his seed. This ultimately contributes to his immortality, in the sense that his lineage will continue.